The native New Zealand Maori were people of an oral culture. Part of this tradition included the passing of stories regarding their surroundings. As part of this, much of the surroundings that the Maori found themselves in was imbibed with spirit or personality, and it was the action of these elements that shaped the landscape of New Zealand. Mount Ruapehu was no exception to this and has its own story. 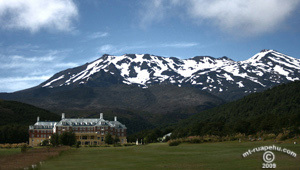 In Maori story telling Mount Ruapehu was a female mountain and it sits beside the male Mount Tongariro, and was at one point wedded to Mount Taranaki. Ruapehu was said to be a beautiful maiden. 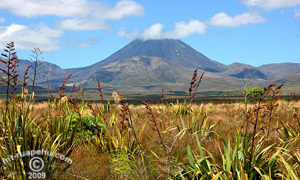 One day, while her husband Taranaki was away, she was seduced by the masculine Mount Tongariro. This infidelity was discovered by Taranaki as he returned. In a fit of anger Taranaki attacked Tongariro, but was defeated. Devastated, Taranaki retreated away from his place by Ruapehu and headed towards the West Coast of New Zealand. In his original location, on the east side of the Tama Saddle, he left behind what is called Rua Taranaki or the Pit of Taranaki. Understandably, the great weight of a mountain in motion carved a trail along the landscape of New Zealand. This trail eventually came to be the Wanganui River. Upon reaching the West Coast, Taranaki decided to move northwards and rest near the sea. His resting ground came depressed under his great weight, this came to be the Te Ngaere swamp. Eventually, Taranaki came to his present location, from which he watches his lost love. On clear days the two mountains are still visible with the naked eye. Perhaps, it is this visibility that causes some tension in the mountains, which in turn causes the volcanic activity of the mountains. The mist which can be see drifting eastward from the top of Taranaki is said to be the physical manifestation of his love for her. While the activity of Ruapehu is her sighs for her lost love. Nearby Tongariro, being a masculine mountain, is sometimes witnessed smoldering and smoking, which is his anger for never being able to have Ruapehu.